Today, I received the (provisional) award for the Timman 50 Endgame Composing Tourney, sponsored by the Max Euwe Centrum and judged by Jan Timman and Yochanan Afek. It was brilliantly won (but see the PS) by a German over-the-board Grandmaster of whom I had never seen studies before - there are none in Harold van der Heijden's database. Black threatens mate. It looks as if 1.Rxf2, also threatening mate, is White's only chance, but after 1...Rxa7 2.exd3 (R- dxe2 and wins) gxf2, Black will eventually win. The draw is hidden in 1.Bxf2! If now 1...dxe2?, then 2.Bd4! and the discovered check (or mate) even wins for White. Therefore: 1...Rxf1+ 2.Bg1 dxe2 (Rxf6 3.Bd4 and White will have time for exd3) and now the surprising 3.Nf3! What good could that do after 3...Rxf3? Well, after 4.Rxf3 e1Q (see diagram on the right) White has the fantastic 5.Rf7!! Beats the moves I showed in the item before. The threat is 6.Rh7+ and stalemate. As Qxg1+ is a theoretical draw (as we will see below), Black must unpin the Bishop while keeping an eye on d4. But, for instance, 5...Qe4 6.Bd4+ Qxd4 6.Rh7+ etc. is still stalemate. The only other thing Black can do is to keep pinning the Bishop, while guarding h7 by 5...Qb1 There still follows: 6.Rh7+ Qxh7 and now 7.Bd4+ Qg7 8.Bxg7+ Kxg7 with an ending that Black cannot win, e.g. : 9.Kg1 Kf6 10.Kh1 Ke5 11.Kg1 Kf4 12.Kh1 Ke3 13.Kg1 Be6 14.Kh1 Bxh3 15.gxh3 Kf3 16.Kg1 g2 17.Kh2 Kf2 with stalemate. PS 15 July: A mail from John Saunders brings a rather dark cloud over this study. He rightfully thinks there should have been more analysis of the position after 3.Nf3 (see diagram). For one thing, it could have been mentioned that 3...Bd5 does not work because of 4.Rf8+ Kg7 5.Re8 Bxf3 6.Rxe2 with a draw. The thought that 3...e1Q also does not work in view of 4.Nxe1 Rxf6 5.Bd4, led Saunders to the winning anticipatory unpin 3...Kh7! Now Black does threaten e1Q, and the only way White's Rook can reach the e-file, has a hidden fault: 4.Rf4 Bd5! (e1Q? 5.Rxh4+ and Nxe1) 5.Rxh4+ Kg7 6.Rg4+ Kf6 7.Rf4+ Ke7 8.Rf5 Bxf3 9.Re5+ Kf6 10.Rxe2, but during this variation, White unwillingly gave life to his h3-pawn - Black can play 10...Bxe2 without stalemating. PPS 17 July: A laudable attempt to repair the study comes from Russell Stinson. In the initial position, he puts White's Rf6 on f5, and Ba7 on g1 - now on 3...e1Q White has 4.Rh5+ and Nxe1, and on 3...Kh7, he has Re5. But this loses too much of the charm of the foreplay. 1...Rxf1 not being a mating threat is an improvement, but Bd4 being mate, instead of a pin or the threat of a discovered check, is much worse. It's still a very nice study, but I doubt this version would retain First Prize. 1.g7+ Kg8 What to do against the Black promotion? Nothing. 2.Bd5 Threatening Be4 and Bh7 mate. 2...h1Q 3.f3 Renewing the threat. Black has only one way to stop the mate; the Bristol clearance 3...Ra1 4.Be4 Qb1 (See diagram on the right.) Now it seems White is finished. But after 5.Bf5!! it turns out Black is in an amazing Zugzwang. After 5...Qxf5, White is stalemate, and other moves also lead to stalemate, or even mate. PS 1 June 2004: As Steve Grant remarks, 3...Rg1 very likely doesn't win either: 4.Be4 Rg6+ 5.Bxg6 fxg6 6.f7+ Kxf7 7.Kh7 etc. In the game, there followed: 30.Rc2 Rxb2+ 31.Rxb2 Qa3 32.Qb3 Bxb2 33.Qxb2 Qe3 34.Bc2 Nd4 and Black won quickly. Of White's possible first moves, 1.d4 can be eliminated immediately, because Black promotes his f-pawn with check. 1.Kxf5 must also be eliminated, because then Black's b-pawn promotes with check. 1.Ke5, then? No, after the pawn race there would follow 6...Qe4+ and Black exchanges Queens and wins with his f-pawn. That leaves the paradoxical 1.Kg5!, noncapturing and away from the action. But it is the only move that draws: 1...b5 (Kb4 2.Kxf5 Kc3 and now, not 3.Ke4 and Black promotes with check again, but 3.Ke5! Kxd3 4.Kd5 and draws) 2.d4 b4 3.d5 Kb5 4.d6! Another hard move to find. 4.Kf6 loses to Kc5 5.Ke6 b3 6.d6 b2 7.d7 b1Q 8.d8Q Qe4+ and White must allow the exchange of the Queens. 4...Kc6 5.Kxf5 Kxd6 6.Ke4 and White stops the pawn. A wonderful thing here is how 1.Kg5 is also a paradoxical introduction to the Réti manoeuvre-of-sorts in the variation 1...Kb4 2.Kxf5 Kc3 3.Ke5! where White both threatens to support his own pawn, and to win the enemy pawn. As the judge of this tourney said: a study like this "isn't composed - it happens, and only once in a lifetime." There are quite a few immortal and evergreen games - those two by Anderssen with Be7 mate, the correspondence immortal, the blitz immortal, the Brazilian, Danish, Polish and Dutch immortals, the Zugzwang immortal, and two or three Games of the Century. A new one to enter those ranks was played at ICC about a year ago. White is the German GM Roland Schmaltz, Black the Israeli GM Ronen Har-Zvi. 1.e4 Nc6 2.Nc3 e5 3.g3 Bc5 4.Bg2 Nf6 5.Nge2 d6 6.h3 Bb6 7.O-O O-O 8.Kh2 Re8 9.f4 exf4 10.gxf4 (See diagram on the left.) 10...Ng4+ The beginning of an unbelievable adventure. 11.Kg3 Nf2 12.Rxf2 (see diagram right.) 12...Qh4+! 13.Kxh4 Bxf2+ 14.Ng3 After Kh5, White will be mated: 14...Re6 15.Kg4 Ne5+! 16.fxe5 Rf6+ 17.e6 Bxe6+ etc. 14...Re6 15.Kg4 Better is Qh5. White must then lose his Queen, but will be out of danger, with a decisive material advantage. 15...Nd4 16.f5 Rg6+ 17.Kf4 After 17.Kh5, Black must take the draw with Rh6+ and Rg6+ etc. 17...Rxg3 18.Qf1 After Qg4, White will at least not be mated. 18...g5+ 19.fxg6 Ne6+ 20.Kf5 Ng7+ A nice finish would have been 20...Rf3+ 21.Bxf3 fxg6+ 22.Kg4 h5 mate. 21.Kf6 Rxg6+ 22.Ke7 Re6+ 23.Kd8 (See diagram.) 23...Bb6 24.Nd5 Re8 mate. An interesting aspect of this game, was that it was a bullet game - one minute each for all the moves. Har-Zvi used a total of 35 seconds - 1 second for 12...Qh4+. Of course it can be argued that the lack of time makes it easier to play such a game - a bullet game is unimportant, all inhibitions are gone, you just gamble a little and when it works out, maybe it was immortal. But even bullet players like to win and hate to lose, and without time for thinking, you have to hit upon the idea of that Queen's sacrifice, have to see it isn't just nonsense but a real magnet combination, have to find silent moves like Re6 and Nd4. On top of all that, you're playing against Hawkeye, the unofficial world champion in this kind of chess. As somebody to whom I showed this game said: what a pity for Har-Zvi that his bliss lasted for only one minute. That will turn out well for him: this game will surely be reprinted many times. That it was not some supernatural happening becomes clear when you look at it a little closer. The central move of the combination, 11...Nf2, took some real contemplation: 4 seconds. Moreover, the Joker missed an earlier mate in 2 twice, with 21...Kf8 en 22...Bh4+, causing him to think hard again: 5 seconds for 23...Bb6. And instead of 24.Nd5, which allowed a mate in 1, White could have caused confusion with Qb5 - Black was in raging time trouble, you see. Today's issue of Alexander Baburin's internet daily Chess Today gave a very nice move played by Ivan Sokolov in the Dutch Championship yesterday. (See diagram.) In Janssen - Sokolov, Leeuwarden, 26 June 2002, Sokolov played 23...Rd2, causing White to resign immediately - the point is 24.Rxd2 Bf3+ 25.Bxf3 Qf1 mate. Inevitably, Sokolov's Rd2 made me think of one of my own few moments of chess glory, also in a Dutch championship, a long, long time ago. The diagram is from Donner - TK, 1st round Dutch Ch. 1967, Zierikzee. White had just played Qc2xPc5, when Ne4 would likely have been winning. Now I seized my chance with 20...Re2. I remember first seeing it as a trick move in a bad position threatening not only Rxd2, but also Rc8 (22.Qa7 Rc7). As I studied the position however, it dawned upon me that he did not have any really good moves against these threats. Best would have been 21.Rf1, but after 21...Qb2 22.Rad1 Rxg2+ 23.Kxg2 Bxd1 24.Rxd1 Rb5 25.Qd6 Qd4 Black is clearly better. 21.Ne4 was even worse, allowing 21...Rxg2+ 22.Kxg2 Bf3+ 23.Kg1 Bxe4 24.Rad1 (24.Qxa5 Rc8 and wins) 24...Rb5 25.Qa7 Rxd5 and Black had a decisive material advantage. White resigned at move 49. In the photograph, the deputy mayor of Zierikzee opens the tournament by playing 1.d2-d4 for Donner against me. As a result of item 170 ("My most ridiculous wins at ICC") I was sent some funny examples by others. Thanks for Jason Fladlien for showing me the following game, which he happened to observe. 1.e4 c5 2.Nf3 Nc6 3.Bb5 g6 4.O-O Bg7 5.c3 e5 6.d3 Nge7 7.Be3 d6 8.d4 exd4 9.cxd4 O-O 10.dxc5 Bxb2 11.Nbd2 dxc5 12.Bxc5 Bxa1 13.Qxa1 Be6 14. Bxc6 Nxc6 15.Bxf8 Qxf8 16.Nb3 Qb4 17.Nbd4 Nxd4 18.Nxd4 Bxa2 19.h4 Bc4 20.Rc1 a5 21.h5 b5 22.Rc3 Ra6 23.Rg3 a4 24.Nf5 Qf8 25.hxg6 fxg6 26. Ne3 Be6 27.Qe5 b4 28.Rf3 Qd6 29.Qb5 Ra8 30.Rf6 a3 31.Qb7 Qa6 32.Qe7 a2 33.Rxe6 a1Q+ 34.Kh2 Qa7 35.Qg5 Qf7 36.Re7 Qxf2 37.Qd5+ Kh8 38.Qxa8+ (see diagram) and Black resigned. Why did he do that, when he had all the time in the world (1:43) and after 38...Qxa8, he would be two Queens up? Because, as my source said: "I was told Black resigned here because he forgot that he had a Queen on a1." Then there were these two games FM David Gertler sent me, which he played one night under his handle randomo. 1.e4 d5 2.Nc3 d4 3.Nce2 e5 4.Ng3 Bd6 5.Bc4 c5 6.Nf3 Ne7? 7.0-0? Nbc6? (see diagram) 8.Ng5 The killing move both players initially overlooked. 8...Qb6 Nothing helps, if 0-0 then 9.Qh5. 9.Nxf7 and Black resigned. 1.d4 Nf6 2.c4 Nc6 3.Nc3 e5 4.d5 Nce7 5.e4 Ng6 6.Bd3 Bc5 7.Nge2 (see diagram) and here, Black didn't hesitate: 7...Ng4 and White resigned - on 8.0-0, there follows Qh4. Chesswire, Kasparovchess' weekly newsletter, always gives one or two tactical positions to solve. Yesterday, it had this perennial favorite (see diagram). Can Black stop White from queening? He can, with 1...Rh4! 2.Kxh4 g5+ and Black wins; a nice square-vacating anti-promotion combination. However, the caption NN - Lasker,E, 1914, made me think of an old joke. Professor asks foreign student: "Now tell me, which organ is this?" - "Ze leever, professor." - "No, this is not ze leever, but ze liver. Furthermore, it is not ze liver, but the liver. And finally it is not the liver, but the heart." The game was not played in 1914 but in 1903 (in London), "Lasker, E." should at least have been Lasker, Em. or Lasker, Ed. ; (it was Em. ); Lasker's opponent was not unknown, but the Dutch top player Loman - and finally, Emanuel Lasker didn't win this game with Black, but lost it with White - in a 20-board simul. It was quite an interesting game. 1.e4 e5 2.Nf3 Nc6 3.Bb5 a6 4.Ba4 Nf6 5.d4 exd4 6.O-O Be7 7.Re1 O-O 8.e5 Ne8 9.Bb3 Na5 10.Qxd4 Nxb3 11.axb3 d5 12.b4 c6 13.b5 cxb5 14.Nc3 Nc7 15.Be3 Bf5 16.Qd2 Qd7 17.Nd4 Bb4 18.Rad1 Rac8 19.Qe2 Bg6 20.f4 Bxc3 21.bxc3 Be4 22.Qf2 f6 23.exf6 Rxf6 24.Nb3 Ne6 25.Nd4 Rxc3 26.Rd2 Rg6 27.f5 Nxd4 28.fxg6 Nxc2 29.Bc5 Rxc5 30.Rxe4 Rc8 31.Rf4 Qc6 (see diagram) Loman had refuted Lasker's pawn sacrifice, but he missed his chances (27...Rxg2+ 28.Qxg2 Nxd4 29.Bxd4 Bxg2 30.Rxg2 Rc5 31.Rxg7+ Qxg7+ 32.Bxg7 Kxg7 and Black wins), and now Lasker finishes him off. 32.Rxc2 Qxc2 33.Qxc2 33.Rf8+ Rxf8 34.Qxc2 hxg6 35.Qxg6 boils down to the same, but this is funnier. 33...Rxc2 34.Rf8+ Kxf8 35.gxh7 Rc1+ 36.Kf2 Rc2+ 37.Kg3 Rc3+ 38.Kg4 But this is a terrible blunder. Approaching the Rook over the bottom ranks would have won easily. 38...Rc4+ 39.Kg5 Rh4 40.Kxh4 g5+ 41.Kxg5 Kg7 and Lasker resigned. Elsewhere on my site, I have a lengthy article about this combination, which I call Loman's Move, and about the Prokeš Manoeuvre, a related anti-promotion combination. PS: Thanks to Richard Forster and Pierre Bourget who pointed out that Lasker - Loman was played in 1903 (on 16 December) and not, as I first said, in 1910. And thanks to Tim Bogan who corrected my initial liverbreaking mistake of writing Emmanuel. To congratulate me with the resurrection of Chess Curiosities, Harold van der Heijden, the endgame study guru and, in recent years, very successful composer, offered me the first publication of his newest study. Harold also offers two prizes for the best solvers; his booklet Pawn Promotion, and his CD-ROM Endgame Study Database 2000 with 60,000 studies. Solutions to me, until 13 May. And many thanks to Harold. PS 20 May: Solution and results. 1.c8Q And not 1.Nxd3 which loses to Qa(f)7+ 2.Kb1 Qxc7 3.Nb2+ Ke1 4.Rd4 Kxe2 5.Re4+ Kf3 6.Rd4 Qh7+ 7.Ka2 Qa7+ and the Rook falls. 1...dxe1Q 2.Rxd3+ Kxe2 3.Qc4! And not 3.Qa6; e.g. Qb4 4.Rd4+ Kf3+. After 3.Qc4 (see diagram), a position of reciprocal zugzwang has arisen; White to move loses, while Black to move cannot win. "The major drawback of the present study," writes Harold, "is that it lacks a try leading to the same position albeit with White to move." Still, it is surprising that Black cannot win. 3...Qa5+ The best try; 3...Qg2 fails to 4.Rg3+, and 3...Qeg1 to 4.Qc2+ Kf1 5.Rd1+ 4.Kb1 The only move. 4.Ra3+ loses to a discovered check by the black King, and 4.Kb2 Ke1+ and 4.Kb3 Qfb6+ 5.Kc2 Qg6 also lose. Now Black has 5 checks with his Queens, and 2 moves that pin the Rook, but none of these are winning. Qf1+, Qfe1+ and Qg1+ all fail to 5.Rd1+; Qab6+ and Qfb6+ fail to 5.Rb3+; and Qff5 fails to 5.Qc2+ and Rd1+ A better try is 4...Qae1+, when 5.Kb2 (5.Kc2 Qf5) loses to 5...Qf6+ 6.Rc3+ Kf2 7.Qc5+ Kf1 etc., but after 5.Ka2!, Black has no better than to repeat moves with 5...Qa5+ 6.Kb1. So: 4...Qaf5 5.Qc2+ Kf1 6.Rd1+ Kg2 7.Rd2 One Queen is pinned now, but after 7...Qb5+, White still has to make one accurate move: 8.Qb2! 8.Kc1 fails to a little staircase: 8...Qg5 9.Kd1 Qg4+ 10.Kc1 Qf4 11.Kd1 Qf3+ 12.Kc1 Qe3 13.Kd1 Qe1 mate. Now, Black has no better than 8...Qf5+ 9.Qc2 Qxd2 10.Qxf5 with a draw. There were 18 solutions, more than I expected, and from all over the world: Holland, the US, the UK, China, Kuwait, Germany, Greece, France, Yugoslavia, Switzerland. Harold and I decided that the winner is GM (and endgame expert and author) dr. Karsten Müller from Germany. In his succinct solution, he gave the major variations, but he was also one of the few who mentioned 1.Nxd3, and the only one to really show why it doesn't draw. Second prize is for Bader Al-Hajiri from Kuwait, who added detailed analysis to show that after 1.c8Q, Qa7+ does not win: 2.Kb1! (2.Ra6 Qf7+ 3.Kb2 Qg7+ and Kxe1 and wins) Kxe1 3.Rxd3 draw. Vojislav Petrovic was the only one to mention the little staircase, and Rolf Knobel showed an alternative draw in the line 4...Qg1+ 5.Rd1+ Kxd1, when apart from 6.Qc1+, winning a Queen, 6.Qd4+ Qxd4 with stalemate is possible. Finally: thanks to everyone who joined in this contest. My website never cost me so much time as when it was down. At the same time, my main page, like the empty spot in the Louvre when the Mona Lisa was stolen, had more visitors than ever. I want to thank very sincerely the many readers who showed their dismay over the disappearance of Chess Curiosities, voiced their anger about the copyright theft that had caused this (see item 171), suggested ways to stop the thief or to protect my pages, mailed him themselves, his provider, his webring. Over 300 mails and postings in rec.games.chess.misc made it clear to me that I had to put my site back up, but first I had to arrange a few things. When I told Matthew Sauget to remove the page he had taken from my site, and he replied that I had to ask politely ("or else"), I knew he was a jerk, spoiling for a fight. I guess I shouldn't have obliged, but there was also this guy who had tipped me, mike355113. He displayed the same belligerent nastiness and impertinence, threatening to steal the whole site. The thought that Matt and Mike were just one jerk, was inevitable. When I said so in this Diary, Mike went berserk, protesting in over 40 mails and postings to r.g.c.m. that he was not, and demanding an apology. Of course, one shouldn't say publicly that somebody is somebody else, but before I apologized to Mike, I wanted to be sure I didn't in fact apologize to Matt. And if I do apologize now, I hope Mike will recognize how hard it was for me not to think that he was Matt. Matt stole from me, Mike threatened to steal from me. Matt changed a little sentence, Mike said he'd make "an exact duplicate, well almost exact, duplicate of your web site but perhaps I'll rewrite some of the articles a wee bit." Matt said "there is no copyright to his kind of material", while Mike wrote that I didn't have the copyright to my pieces. Mike likes long strings of ! 's ("Paybacks are hell!!!!!!!!!!!!!!!!! "), while Matt is given to using ?-strings. On the other hand, Matt often uses !! !, where Mike likes ???. Matt wants to be hated, Mike craves to be unloved - both successfully. Mike goes bananas when he's accused of being Matt, but among all my correspondents, he's the only one who never scolded him. But there it is - all these similarities evaporate in the face of one inescapable difference. While behind Matt there is a real chessplayer, the ICC computer cheater Matthew Sauget (ps189x), there is nothing behind Mike. No verifyable name, published games, rating, address, club - nothing but anonymity. So: my apologies. They can't be the same - Mike is a jerk in his own right. In the end, perhaps satisfied that he made a name for himself as everybody's Hate Guy in Chess, Sauget did remove my page from his site. Just too bad he doesn't know how to remove another copy of that page he has at geocities - he also still has my animated GIFs there, along with his 3 million game database "I have placed for you to download" - which, on closer inspection, turns out to be the Pitt Archives. Sauget hasn't shown any sign he sees any wrong in what he did and is still doing - essentially, we are the jerks, ("people have no manners anymore") bothering him about something as futile as copyright. He had his day in the limelight - but no more free limelight from me. If Matt does it again, or Mike fulfills his threat, they will be dealt with outside of it. And again, thanks for all the support. If you see anything fishy concerning Chess Curiosities, let me know. Some chess composers have a habit of jotting down diagrams of their compositions and of their works in progress. I've sometimes thought of making a collection of such drawings, but since Leonid Yarosh drew his famous Babson Task for me, just 2 days ago when I visited him in Kazan, that's the only one that interests me. Here's a picture of Leonid and me in the Bauman street in Kazan, under the plaquette for Rashid Nezhmetdinov who lived in that house. Emmsing reached unprecedented heights when I found a story from my website ('Diagram of the century') on another site, with no mention of my name, and with (c) Matthew Sauget underneath it. There is no email address on that site. Could anyone tell me how to reach this guy? PS: Thanks for all the help I'm getting with this. I found out that to lodge a complaint with his provider, I have to fill out a 17-page form, and pay a registration fee. That means that either I should get a $200-an-hour lawyer, or that this kind of small-scale copyright infringement goes scot-free. I was helped to Mr. Sauget's mail-address, and I asked him to remove that piece. But as he's obviously a person of ill-will, it is unlikely he will respond. I hope chess-friends of his who read this will persuade him to do the right thing. He's a nurse living in Fort Lauderdale, Florida. This kind of thing gives me second thoughts about publishing for free on the Net. 1: While playing on ICC, I used a computer chess program to assist my play. This is against ICC rules. I apologize for this and promise not to use assistance of any kind in the future. It seems he still uses some assistance with his writing, though. This discovery made me realize that the person who first tipped me about this thing, had of course been Matthew Sauget himself. Then, when I had a closer look at that fine story Diagram of the Century on his site, tears came to my eyes. The info for that page revealed Matthew Sauget had posted it in May 2000 - two years ago. Imagine that - Sauget wanting to be known as a Bad Boy, but for two long years, nobody came and noticed. Until finally he couldn't stand it anymore. Of course I'm honored he chose my site. But why not try bigger fish? He's a 1200-player, but that shouldn't stop him. I can just see it: My 60 Memorable Games by Matthew Sauget. If there's one loser I really hate on ICC, it's the guy who will tell you you've been lucky, when you've been lucky. It's bad losership, and it shows ignorance about chess. Laymen often think chess is a game where logic and reasoning will prevail, but we should know better. If world champions blunder whole points in serious games, then what are our blitz games supposed to be? Blitz, for us, is a game of chance, which is precisely what makes it a game of skill. To keep your eye open for chances that might pop up, no matter how lost you are, to grab them when they're there, is what it's all about. And Donner was right: No win is as rewarding as an undeserved one. Except that this kind of win isn't undeserved at all, in blitz. One advantage of Internet chess is that with a few mouse clicks, you can do something that was never possible: build a database of your blitz games. Here is a small selection of my 'Most Ridiculous Wins at ICC (and other servers)' - send me yours. PGN, please. And beware - what follows is some of the worst chess that has ever been published. All are 3' or 5' blitz games. From M*** - TK, ICC 2001. We both had 20 seconds left. I don't know what we were doing, preparing for a mouse race perhaps, or we just forgot to offer a draw, but there followed: 51.Rh8 Rh3+ 52.Kb2 Rxh8 and White resigned. In T*** - TK, ICC 1998, White could have exchanged one pair of Rooks with Re7+. Instead, after 41.Rf7+ Kh8, he resigned. He probably saw nothing against Rg1+, least of all that it was hardly a threat. I guess no game was ever resigned when so many moves - practically all of them, perhaps even Ra1 - were winning. 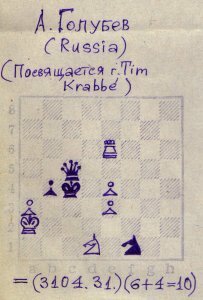 In TK - J***, FICS 1995, Black, being four pawns up, had good chances. He should perhaps have exchanged one pair of Rooks with 48...Rg3+ 49.Kf1 Rh1+ 50.Kf2 Rh2+ etc., or have played e3, but with 48...Re6 49.Rh2+ Kg8 50.Rhh7, he let my Rooks to the seventh rank where they were very menacing. With Rg6+, followed by Rf3, he could still have stopped them, but after 50....c5 I had a draw: 51.Rhg7+ Kf8 52.Rgf7+ And when Black avoided that draw with 52...Ke8, the mating threats after 53.Rh7 cost him a Rook. There followed: 53...Rg6+ 54.Kf1 Ra1+ 55.Ke2 Rg2+ 56.Ke3 Re1+ 57.Kf4 Rf2+ 58.Ke5 Rd1 59.Rc8+ Rd8 60.Rh8+ Ke7 61.Rc7+ Rd7 62.Rh7+ Rf7 63.Rxf7+ Kxf7 64.Rxd7+ Ke8 65.Rd6 b5 66.Kxe4 a5 67.Kd5 c4 68.Kc5 Ke7 69.Rd1 and Black resigned. This is not in itself a ridiculous win. In fact, I think the game is rather good. 1.e4 e5 2.Nf3 Nc6 3.Bb5 a6 4.Ba4 Nf6 5.O-O Be7 6.Re1 d6 7.c3 Bg4 8.h3 Bh5 9.d3 Qd7 10.Nbd2 g5 11.Nf1 g4 12.hxg4 Bxg4 13.N1h2 Rg8 14.Nxg4 Qxg4 15.g3 Nh5 16.Nh2 Qh3 17.Nf1 (see diagram) 17...Nxg3 18.fxg3 Rxg3+ 19.Nxg3 Qxg3+ 20.Kf1 Qh3+ 21.Ke2 Qg2+ 22.Ke3 Bg5 mate. Thanks to Martin Schrödl for pointing out a new genuine practical Bishop promotion, from a game McShane - Wilhelmi, Lippstadt 1998. In the diagram, White played 84.Rg8!, although after 84...Rxg8 85.hxg8B he had to work some more: 85...Kg5 86.Be6 Kf4 87.Kxd4 Kf3 88.Kd5 Kf4 89.Kd6 Ke4 90.Ke7 Ke5 91.Kf7 Ke4 92.Kxf6 Kd3 93.Ke5 Kc3 94.Kd5 Kd3 95.Bd7 Kc3 96.Bb5 Kb4 97.Kc6 Kc3 98.Kc5 Kd2 99.Kd4 Kc2 100.Bc4 Kd2 101.Bd3 Kd1 102.Ng3 Kd2 103.Ne4+ Kd1 104.Kc3 Ke1 105.Bc4 Kd1 106.Nd2 Kc1 107.Nf1 Kd1 108.Ne3+ Ke1 109.Kd3 Kf2 110.Bd5 and Black resigned. 85.hxg8N was theoretically winning too, but that would have been much harder. From July 1997 to February 1998, there was a player named mercilous at ICC, whose FIDE rating would have been a measly 2150 or something, but who won hundreds of games against strong computers, always with the same simple trick, very often with exactly the same game. 1.d3 d5 2.Bd2 Nc6 3.h3 e5 4.g3 Bc5 5.e3 Nf6 6.Na3 When you plan a holdup on h8, you call the police there's a fire on a3. 6...O-O 7.h4 Bxa3 8.bxa3 Qd6 9.Bh3 Bxh3 10.Rxh3 And they come running: 10...Qxa3 11.Nf3 e4 12.Ng5 h6 13.d4 Qd6 (see diagram) 14.Bb4 The boldest, most cynical move I've ever seen: the ultimate anti-chess. Its brilliant point will become clear on move 18. 14...Qxb4+ 15.Kf1 Rab8 16.Rh2 Threatening Nh3 and forcing, at least against a computer: 16...hxg5 Like Dr. Strangelove's arm. After 16...h5, White resigns. 17.hxg5 Ne8 18.Qh5 Qb5+ This check, handed to him at move 14, and which explains why he didn't play Nxb4, pushed the disaster over the poor superbrain's horizon. 19.Kg2 f5 20.g6 Qf1+ Remorse. 21.Rxf1 Nd6 22.Qh8 mate. Of course, mercilous lost often, too. When ICC introduced a rule which made it impossible to play the same line against computers over and over, he disappeared; his identity has never become known. Compare Defending humanity's honor, elsewhere on this site. As a birthday present to myself for my 60th birthday (13 April 2003), I am sponsoring two composing tourneys - one for Endgame Studies, and one for direct Moremove Problems. In both sections, themes are free, and prizes will be 400, 200, 100, 2 x 50 and 2 x 25 Euro. Specifics on my tourney page. 1.Ng8 Bxg8 2.Bxa4 Qxa4 and now the amazing central move of this study: 3.Rd7!! The threat Nf6+ forces stalemate or a theoretical draw in all variations, e.g. 3...Kxd7 4.Nc5+ or 3...Qxd7 4.Nf6+ or 3...Qxe4 4.Rd8+ Kxe7 5.Re8+ or 3...Qa6 4.Nd6+ Kxd7 5.e8Q+ Kxd6 and now, unfortunately for this study, not only 6.Qg6+ Be6 7.Qd3+!, but also 6.Qb5 Qa7 7.Qb8+ etc. Mate in 7, Alois Johandl, 1st Prize Carl Schrader Memorial, Die Schwalbe 1964. White's mating plan is 1.exd3 and 2.d4, but 1...a1Q (1...Nc6 2.Kxc6 and 3.Nd7 mate) spoils everything. Therefore: 1.Nf8 (Threatening Nfd7 mate) 1...Kxf6 2.Nh7+ Ke5 Back in the diagram - without Pf6, but what has White gained by that? 3.exd3 a1Q 4.Nd7+ Kd5 5.Nhf6+ Using the now-vacant square to lure the Queen over the critical square e5, so that after 5...Qxf6 6.Nb6+ Ke5 it is shut off from guarding d4, and blocks f6 at the same time: 7.d4 mate. Among other things, an example of the Mousetrap Theme. As Gerard Bouma, who showed me this, remarks: "Crystal clear. Unforgettable." The other night on ICC, I chanced upon BlackSky - B-Amin, a 5 0 game with Black to move. He had several ways (Bd6, Kc8, Bb4+, Rxc2) to keep the piece, but with 19...Nb4, he became one more victim of that old castling trap, be it in a form I had never seen before: 20.0-0-0! Now whatever Black plays, the combined dangers of the d-file and the Pc7 always cost him a piece. He chose 20...Rxc2+ 21.Kb1 Rxc7 22.Nxb4+ and lost in the end. Compare entry 14 in this diary. My love of chess stems partly from my love of numbers. So when I set up a chess site, it was inevitable that I would place counters on my pages. It was nice to see that any visitors came at all, and exciting to see their number grow. But NedStat supplies a lot of additional interesting information. I can see where my most recent visitors come from, sometimes finding a new link to my site - or I discover that someone, during his stay at www.animalsexxx.de suddenly felt the urge to look at chess positions. My main page has 400-550 visitors per day these days, but what happened on 22 and 23 December last year, is still a mystery to me. On each of those days, close to 1000 visitors clicked in, half of them from the UK provider COLT Internet. A visit to COLT did not yield any mention of my site, and I still don't know what prompted all those visits. Have I been the object of some scavenger hunt? NedStat also keeps track of the countries my visitors come from. Chess Curiosities is mainly in English, and they come not only from Holland and Belgium, but also from the US and Iceland, and from Saint Helena, Kuwait, Bhutan, Mongolia, the Cocos Islands, Macau, Andorra, Groenland and Gibraltar. It is always a joyful discovery when a new country has joined the list, but after almost four years of counting, and 148 countries, my world doesn't grow too quickly anymore. And if a new country is still added, its counter will usually stay at 1 or 2. Not so with the Fiji Islands. That small country was about the 120th to join, but some time later I noticed it had overtaken a whole pack, and was in the top 40, ahead of Turkey, Latvia, Croatia, China and Luxemburg. What was going on there? It couldn't be that the whole islands group was suddenly in the grip of a Chess Curiosities fever - it had to be a single fan. But who? Dr. Virgilio, the Fiji Chess Federation's President? Kaushik Saksena, the champion? Inquiries remained unanswered. Then, just as mysteriously as the Fiji droves started coming to Chess Curiosities, they stayed away. For months now, the Fiji counter hasn't changed. Croatia, China and Turkey shot right past Fiji again. Did my Fiji visitor die? Did he move? Has he read all? Stopped loving chess? A team of investigators is on its way. Sicilians and French games transposing into each other, or Queen's Gambits becoming Stonewalls are a common sight, but I was astonished the other night on ICC, when I saw this: 1.e4 e5 2.Nf3 Nc6 3.Nc3 Nf6 4.Nxe5 The Halloween Attack 4...Nxe5 5.d4 Nc6 6.d5 Which seems to have made a major step in its career: it is sometimes declined now: 6...Bb4 7.dxc6 bxc6 (see diagram) And a position had arisen which we all know from the Scottish Four Knight's game: 1.e4 e5 2.Nf3 Nc6 3.Nc3 Nf6 4.d4 exd4 5.Nxd4 Bb4 6.Nxc6 bxc6 with the difference that there, it is reached one move quicker. It was a good thought of Manuel Iglesias to collect the personal notes of Tony Miles on ICC - which are still there now, but might be deleted any time. 1: No I am not Tony Miles. in front of a log fire. 4:  Please bring your own logs. shows that more dont help). The question is :  Who are you? a ten page philosophical discussion, nor b) nobody/ no-one. 9: PS It is my test so I make the rules! "Last disconnected Sat Nov 10 2001 21:08" - that was Miles' early Sunday morning, 2 AM. He was last seen by his friend Malcolm Hunt, who writes (on the website of the Four Nations Chess League): "I had a beer (or several!) with him on Saturday night and returned him home in good spirits." So, earlier that day, he had been logged in for 4 hours, and after coming home, he logged in again a few times, finally calling it a day at 2:08 AM. Strangely enough, he did not play any games during those hours - the last games in his ICC-history are from October, 4th. The fact that he logged in around noon, both on Friday and Saturday but not on Sunday, suggests he might have died just a few hours after his last disconnection. He was found dead Monday night 12 November, when Hunt called on him to go to a bridge club. Here is one of Miles' last ICC games. 1.d4 Nf6 2.Bf4 g6 3.e3 Bg7 4.h3 O-O 5.Nf3 d6 6.c4 Nc6 7.Nc3 Nd7 8.Bh2 e5 9.Be2 f5 10.O-O f4 11.exf4 Nxd4 12.fxe5 Nxf3+ 13.Bxf3 Nxe5 14.Be2 Be6 15.Nd5 c6 16.Ne3 d5 17.cxd5 cxd5 18.Qb3 Bf7 19.Bxe5 Bxe5 20.Rad1 d4 21.Bc4 Kg7 22.Ng4 Qc7 23.Bxf7 Rxf7 24.Rfe1 Bf4 25.g3 Bd6 26.Rxd4 Bc5 (see diagram) 27.Qc3 Raf8 and Black resigned. Thanks to John Henderson for the picture. Went to the Corus tournament today, and if I had stopped talking and playing blitz for a second, I might have seen the leader, Bareev, beaten in 20 moves by Khalifman. 1.e4 e6 2.d4 d5 3.Nc3 dxe4 4.Nxe4 Nd7 5.Bd3 Ngf6 6.Qe2 c5 7.Nxf6 Nxf6 8.dxc5 Bxc5 9.Bd2 O-O 10.O-O-O A double pawn sacrifice which Khalifman had analyzed some 15 years earlier. All that he remembered, he said, was that it is good for White. 10...Qd5 11.Kb1 Qxg2 12.Nf3 Qxf2 13.Qe5 Be7 14.Rdf1 Qc5 15.Qg3 Nh5 16.Qh3 g6 17.Rhg1 (see left diagram) 17...Nf4 A tactical attempt to exchange some pieces, but it backfires. After 17...Ng7, Black can defend. Now, White wins by force. 18.Bxf4 e5 19.Qh6 exf4 (see right diagram) 20.Rg5! and Black resigned. 20...Bxg5 21.Nxg5 is mate, and if the Queen moves, there follows 21.Rh5, also with mate. And after 20...f5 21.Rxg6+ hxg6 22.Qxg6+ Kh8 23.Qh6+ Kg8, White does not play 24.Rg1+? Qxg1+, but 24.Bc4+! Qxc4 25.Rg1+ Kf7 26.Qg6 mate. PS 26 January: Always ready for adventure, especially when he's in bad form, Van Wely, against Morozevich today, accepted the double pawn sacrifice with which Bareev had lost in 20 moves against Khalifman yesterday. He lost even faster, deviating at move 13 (see diagram). Morozevich - Van Wely went: 13...Nd7 14.Bxh7+ Kxh7 15.Qh5+ Kg8 16.Rhg1 Be3 17.Bxe3 Qxe3 18.Rg3 Qc5 19.Qh6 and Black resigned. PS 28 January: Looking in the databases, I discovered that Van Wely had played this line before the Corus tournament. In Anand - Van Wely, blindfold game, Monaco 2001, Anand had played 17.Bc3, and had won after 17...f6 18.Rdf1 Qe2 19.Re1 Qf2 20.Ref1 Qe2 21.Re1 Qf2 22.Qg4 Rf7 23.Rgf1 Nf8 24.Rxf2 and some more moves. Some time ago, a non-chess friend asked me: "Tell me, what is the Wimbledon of chess?" In vain, the hand of my tongue tried to find words in a deep black bag, as the greatest Dutch writer once put it. We don't have a Wimbledon: no Superbowl, no Tour de France, no World Series. We used to have a Wimbledon many sports envied us: once every three years, there was a Herculean struggle between two giants that held us breathless for months. Now we have the tossing of a bridal boucquet. Of course, it is a matter of tradition what a world championship should be like. Wimbledon never needed to be called "World Championship" to be just that, and its formula always produces a worthy champion. In cycling, on the other hand, there is a yearly one-day race, which has been won by emperors like Merckx and Coppi, young princes like Armstrong and Monseré, but also by old royalty like Zoetemelk, lucky noblemen like Simpson and Knetemann, and stableboys like Müller - and everybody likes it, because it has always been that way. When Kasparov walked away with Short in 1993, FIDE was left without a World Championship, and when Kramnik walked away with Kasparov's crown in 2000, that crown lost its Wimbledon glitter. Kasparov doesn't get a rematch and is right in refusing to compete in Braingames' tombola for a challenger. 'We bent over backwards to meet his demands,' Keene has said (quite a feat, with that belly), but all that was really bent, was tradition - semis and finals of the Braingames Candidates Tournament will be 4-game matches. As long as he wins tournaments, Kasparov doesn't need to be called 'champion' by anyone to be the champ, a fact he likes to stress by calling Kramnik the true world champion. Congrats to the young GM Ruslan Ponomariov, for winning that strong rapid tournament.